The new Faberge Museum in St Petersburg is cracking, says Laura Ivill. On a summer’s day you will see a snaking queue, two hours long, of expectant visitors to St Petersburg's premier attraction, the State Hermitage Museum. This month [January] a new museum opens, yet even in the height of summer, there will be no queue; there will be no ticket desk. Entry to the Fabergé Museum must be pre-booked, and you won’t see much change from £70 a pop. In December, I had a leisurely preview of the 12 galleries of this private museum housed in the restored Shovalov Palace, which promised 1,000 objets d’art of the Fabergé workshops, including the famed Easter eggs of the tsars, and a further 3,000 from other notable pre-Soviet master craftsmen. 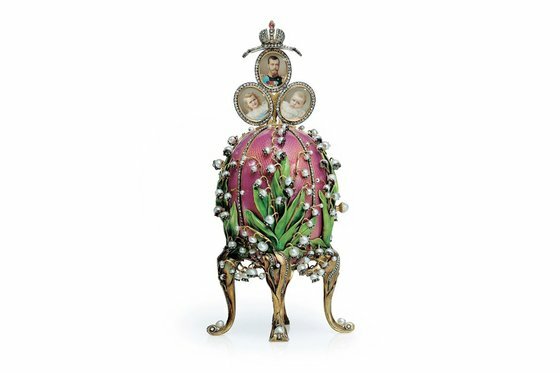 To me, even the name Fabergé conjured up an array of dazzling jewels, delicate enamel work, and, of course, those priceless eggs. At £140 per pair of tickets, however, could it possibly be worth the price? I hardly knew where to start, so much was there to scrutinise. The colours, all shades of ruby, pink, emerald, yellow, blue, lavender, and adorned with gold and jewels, were as lustrous as the day they were made, and Fabergé, his imagination given free rein, came up with progressively more fantastical designs, each containing a “surprise”. I admired for a long time the ingeniousness of the Bay Tree, from which a feathered songbird rises from the tree’s foliage of finely veined leaves, studded with diamond fruit. It used to flap its wings, move its head and sing. The eggs were created by the Fabergé workshops for the tsars to give as gifts in statements of opulent frippery. From the first egg commissioned by Emperor Alexander III for his wife in 1885 – mimicking a chicken’s egg of white enamel covering a golden yoke and containing a golden hen (the crown and miniature ruby pendant now lost) – through The Rosebud egg containing a yellow-enamelled rosebud and The Coronation egg with its minutely detailed golden coach inside, it will appeal to Fabergé aficionados and Antiques Roadshow fans alike. 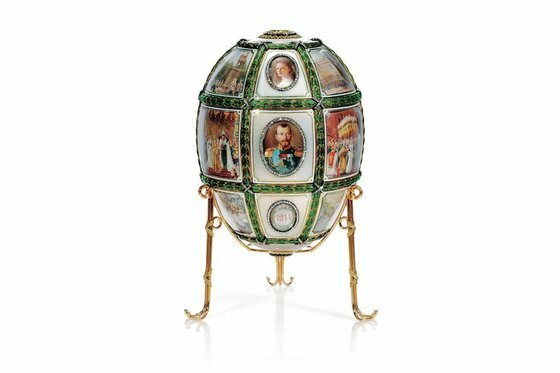 The nine eggs here created by Peter Carl Fabergé, of St Petersburg, were the stars of a collection of Fabergéobjets d’art that once belonged to the Forbes publishing family. In 2004 they were snapped up by the Russian billionaire Viktor Vekselberg who bought all 200 lots before they went to Sotheby’s for auction - for a suspected $120 million. The decision by the Russian government to lift its 30 per cent import tax on art and antiquities paved the way for Vekselberg’s collecting frenzy, to return to his homeland some of the treasures that had been sold off by the Soviets after the revolution to rid the country of all vestiges of the Imperial Family, and raise a pretty penny in the process. After a decade of collecting, the palace rooms are filled with case upon case of dazzling silverware, intricately enamelled dinner services, figurines, snuff boxes and even mini eggs that were produced in their thousands and sold to the masses. If you have ever been squished and shuffled by a hoard of cruise-ship tourists in the Hermitage, let out a sigh of relief that all groups here will be limited to a maximum of 15, and you can book a slot for just two. If you compare it to two top-price tickets at the Mariinsky Theatre, where you will be in the company of 1,625 other people, then this feels like a privilege. With only an hour permitted for each visit, however, there’s so much more to enjoy than you will have time for. No doubt sales of the exhibition catalogue will be brisk. The Fabergé Museum, St Petersburg, opens to the public mid-January. Laura Ivill was a guest of Russia specialist Exeter International, which offers four nights at the Four Seasons Lion Palace (fourseasons.com/stpetersburg) B&B, including return airport transfers, flights, two days with a private guide, driver and entrance fees, from £1,780 per person sharing (£2,100 high season). Exeter can include visits to the Faberge Museum for £140 for two, or try the Four Seasons (exeterinternational.co.uk, 020-8956 2756).